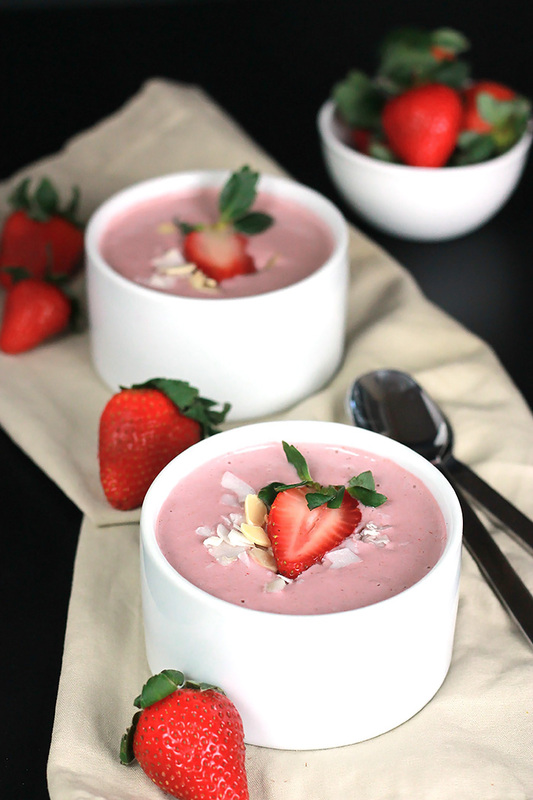 Silky, smooth, creamy and bold this Roasted Strawberry Soup is a wonderful way to celebrate Spring! Spring is almost here, can you believe it? So in honor of Spring I made this incredibly delicious Strawberry Soup, that’s Roasted Strawberry Soup. 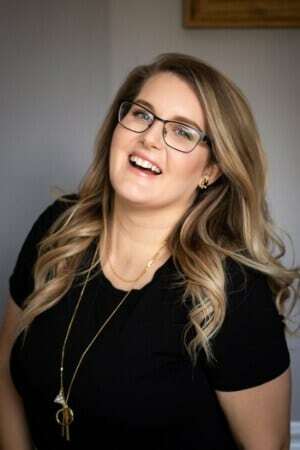 Happy Spring all you This Silly Girl’s Kitchen readers. It’s Celeste from The Whole Serving, you are going to love this soup. Roasting the berries sprinkled with cinnamon and pinch of nutmeg gives it a bold intense flavor. I love easy and I think this is by far one of the easiest recipes I’ve shared ever. After roasting the berries all that needs to be done is blend, blend, blend the berries with a can of coconut milk and a bit of citrus. A year ago I was introduced to Young Living essential oils and I used them, but not consistently. In January I purchased a starter kit and stared using the oils regularly and started to benefit from their use. I was really excited to order some of the Young Living food grade oils and include them in some of my recipes. 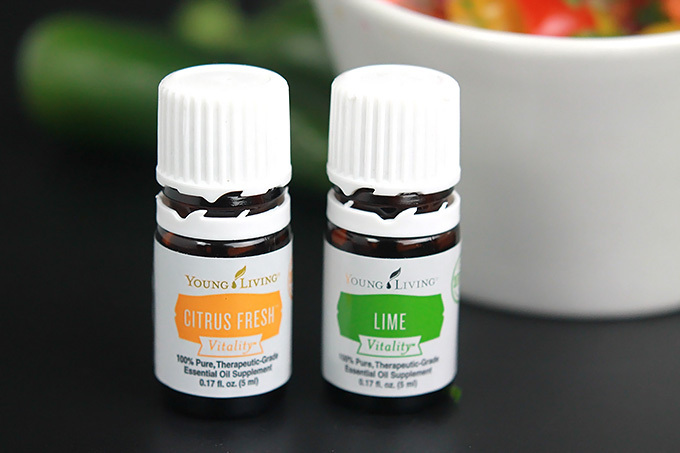 The two I included in this soup are Citrus Fresh and Lime for more information on Young Living oils check out Essential Oils. This amazing soup can be served as a side with a salad or sandwich as a dessert or special afternoon treat. 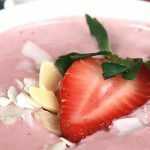 This Roasted Strawberry Soup is simply a beautiful culinary experience and a great way to celebrate Spring. Preheat oven to 350 degrees and line a shallow baking pan with parchment paper. 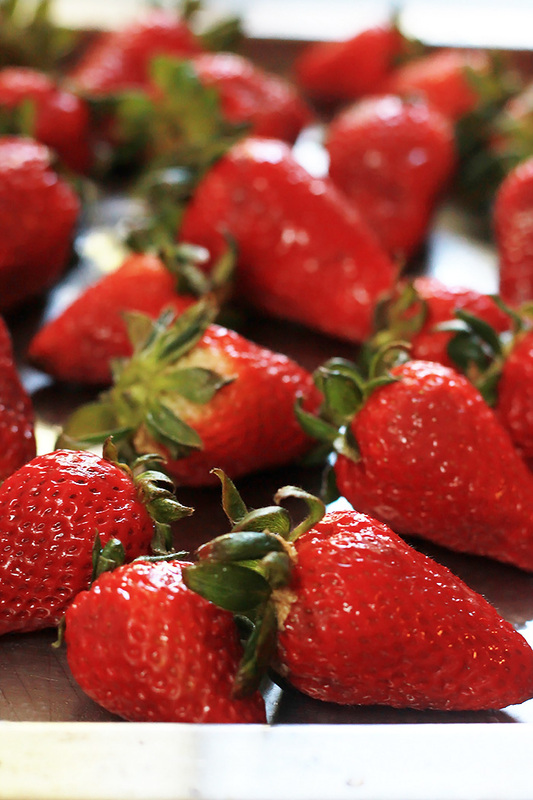 After washing the fresh strawberries place them in a large bowl and toss with the coconut oil. Sprinkle on the cinnamon and nutmeg, toss and transfer to baking pan. Place in oven and bake 25 to 30 minutes. 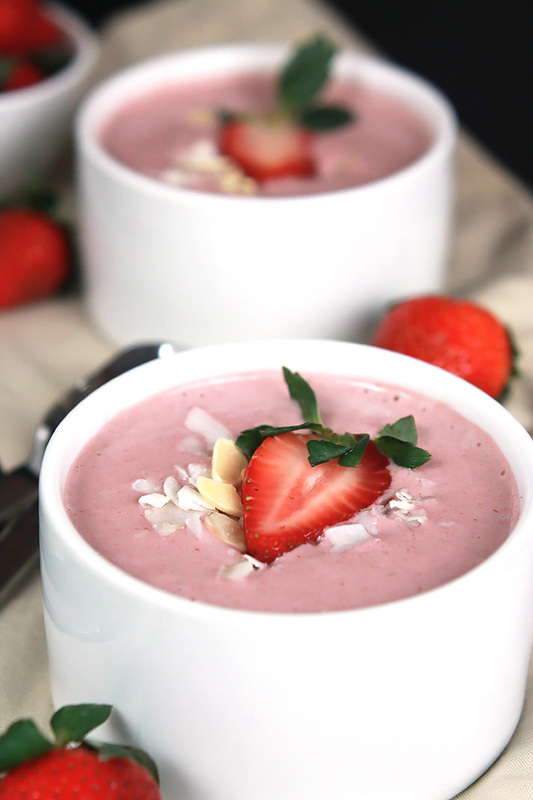 After strawberries have cooled, place in blender with coconut milk, essential oils or fresh lemon and lime juice and blend until silky smooth. Place a few fresh sliced strawberries in serving bowls and pour soup over berries, garnish with coconut chips and more fresh strawberry slices. This is too cool not to share, Love! Thanks, I hope you have a chance to try it soon. Mmmm. I love fruit soups. Can’t wait to try this…pinned and yummed! I got Strawberry Soup on a cruise once and loved it! I can’t wait to try your recipe. This looks delicious! I have never tried a fruit soup, but this looks like a great place to start. Found you at Let’s Get Real. Pinning! What a great way to use up some fruit that may be a little too “ugly” to eat otherwise. Always looking for recipes that use less than perfect produce!